A positive attitude keeps you on track and content. – Tigger always knows where he is and where he’s going. He manages to have some fun along the way too. He stays upbeat and loves to be around his friends. Positive energy inspires others. – Good leaders are good motivators and they tend to be very positive thinkers. Tigger is like that. He stirs up his friends’ energy levels and helps them accomplish their goals. Happiness is knowing who you are. – Tigger once lost his stripes, and with them his sense of self. Trying to be everyone else just frustrated him, until he realized that he could only be himself in order to truly be happy. Then his stripes began to reappear! Face life with enthusiasm, and you’ll succeed. – Tigger doesn’t let circumstances affect how he approaches life. He feels unique and motivated. He finds his way through the fog and helps others find their way too. Upbeat people always have friends. – Because they fill the room with positive energy when they walk, or bounce, in. They make friends easily because their enthusiasm is attractive to others. That same quality also makes them good friends to have. Don’t let critics or problems get you down. – Tigger demonstrates that it’s possible to keep a positive self-image and be patient with those (like Rabbit) who take him to task. We don’t have to let others dictate how we feel about ourselves. You can bounce back from anything. 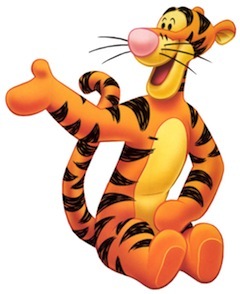 – Tigger refuses to let the schemes or attitudes of others keep him from enjoying life and having fun. He knows who he is and when he’s around someone who tries to spoil his day, he just bounces on out of there! You are unique. – Just like Tigger, you’re one-of-a-kind, with a special blend of talents and qualities that no one else has. You have a purpose each day, just like Tigger, that only you can do. Tigger is bigger than his flaws. – Sure, he mispronounces words, and enjoys a little mischief; but he’s always ready for anything, including helping out a friend. He won’t let a few little blemishes define who he is. He knows he’s special. You don’t need to be mean to overcome meanness. – Even when Tigger knows he’s getting the business from Rabbit, he still tries to be a friend and stay upbeat. He won’t return evil for evil. He stays true to his core personality and outlook, no matter how badly he’s treated.